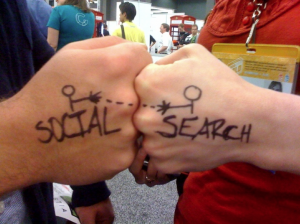 Search vs social discovery is a debate that’s been going on since Twitter’s ascendancy as a link discovery machine. TheMediaBriefing has an interesting piece that suggests hybrid discovery is the eventual goal – a blended approach that ignores neither option. It’s a sensible conclusion, though I don’t share the belief that search traffic is necessarily disloyal – or that social media traffic is necessarily loyal. Both are used too broadly by too many readers to be so easily characterised. Search is private, while social is public (at least to some degree, depending on your privacy settings). People will search very honestly for what they want to see, and will express ignorance, voyeurism or an interest in the salacious in the secure knowledge – or at least the reasonable belief – that no one but Google will ever see that information about them. Google autocomplete suggestions are full of quiet questions asked by millions in private. But through social media, people will share what they think makes them look more like the idealised version of themselves. We use social media to construct our identities for other people to consume, and in so doing we share what other people will think we look good for sharing. For the most part we’ll ask stupid questions, or difficult ones, for the purposes of illuminating a facet of ourselves or to call for interaction with others – not necessarily to gain information. We’ll share what outrages us in order to comment on it, but read what interests us without sharing if we can’t fit it in to our constructed identity. This is one reason why frictionless sharing is a problem: what we read and what we want to tell others we read are two vastly different things. It’s also one reason why social and search end up positioned as adversaries, when in fact they are complementary allies. Search discovery for publishers is not serendipitous; it relies on information-seeking queries, on individuals being interested enough in something specific to type words into a page and select from what appears there. It isn’t about teasing headlines or making someone wonder about what comes next; it’s about being as relevant as possible right there and then. Often, that includes personalisation, or simply being a reader’s preferred source for a story; loyal readers come through search as well. Social discovery, by contrast, is about stumbling upon something potentially interesting because it’s been passed on by friends or by individuals you trust. It’s about not knowing you wanted to read something until it’s in front of your face. And a successful social piece works because you enjoy reading it, and you want to pass it on, and so do dozens of others. But social discovery happens as an interruption to the flow of doing something else; you move seamlessly from browsing Twitter/Facebook/Reddit/wherever to a different site for a link, then hit the back button and return to your browsing. It’s a diversion, not a journey in its own right. Because of the commercial sensitivity around reach and discovery for publishers, an awful lot of inaccuracies get cheerfully spread online. For some time, there’s been a popular conception that search and social are fundamentally at odds, when in fact they’re often fundamentally intertwined. Plenty of news organisations reach the same people with both, at different times, with different articles. And plenty of pieces work perfectly for both, because they both illuminate a relevant issue for those directly interested, and make for interesting reading for those who didn’t yet know they cared. As Jackson says, what matters most is making content people want to consume. Making sure they can find it is the second step. Interesting piece – thanks for this Mary. Regarding the seeming lack of serendipity in search, I’d contend that this is becoming less and less the case. Or, more precisely, that enterprise search (Google, Bing, etc.) is more and more offering up paths of discovery to related resources, rather than simply returning information strictly relevant to a query. This is epitomized by Google’s ever-growing Knowledge Graph (and its increasing number of physical manifestations in the SERPs). For example, if you search for “guglielmo marconi” you’ll now see a carousel of figures related to Marconi for which others search (Albert Einstein, Thomas Edison, etc.) as well as a Knowledge Graph information box with linked entries about Marconi’s life, inventions, and so on. While these are not wholly serendipitous connections (because they are based on entities that are somewhat related), this nonetheless goes well beyond the now anachronistic “10 blue links” directly offered in response to an informational query. I think publishers need to understand and explore these changes in order to better leverage them. In regard to “search vs. social” I smiled when I read “there’s been a popular conception that search and social are fundamentally at odds,” because that’s precisely the opposite of how both search and social marketers have long conceived of the relationship between the two areas. And while it has not yet played out explicitly in this fashion, social activity has long being touted as the heir apparent to the web page links that are crucial to the search engines in the ranking of documents. That is, links are considered “votes” for a resource, and a page with a large number of quality links will outrank a page on the same subject that have has fewer and/or lesser quality links (in broad strokes, as there’s a ton of nuance that I’ve omitted). Furthermore, the relationship between search and social is often direct, as you can see now with some branded queries in Google that will generate a vertical showing posts from Google+ (e.g. “new york times”), or Bing queries that include a vertical with Facebook and/or Twitter results. Thanks Aaron – those are really good points. I do think, though, that as much as Google and Bing are increasingly serving related results and using social signals to improve search relevance, they’re still seeking relevance to an information-seeking query, which isn’t the same thing as serendipitous stumbling across something a user didn’t know they wanted. That I think is something search is always going to struggle with, because it’s not telepathic. Even on social media the chances of that happening are only as good as the networks an individual user builds to encourage it. Incidentally, the earliest links I found that frame search and social as dichotomous but in need of integration within a business are from 2006-7. I wonder if the idea of them being fundamentally at odds has primarily existed as a straw person for search and social marketers to write against, and in writing against it they’ve lent it more authority than it would otherwise have had.